One thing we have learned since starting Flaming Licks is that there is a lot of variety in the hot sauce market. With spice and heat being embedded within so many cultures across the globe, there is always something new and surprising to try. We’ve gotten used to seeing ingredients such as cocoa, mustard and fruit showing up in our sauces but this is a new one on us. 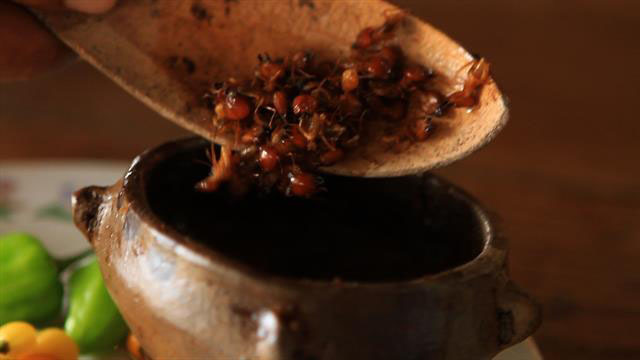 In the video below, National Geographic shows us how Kumache, a hot sauce in Kumarakapay, Venezuela is made. Red ants and termites are hunted down and thrown in with a mix of boiled down yuca and peppers. It’s not something we have tried, but we’re game to give it a shot. If you’ve come across this sauce before or better yet tried it let us know your thoughts in the comment section below. If you’re looking for something a little more conventional why not check out our hot sauce shop? This entry was posted in Knowledge. Bookmark the permalink.